It really was such a lovely weekend, I feel compelled to share, even though I've written about all these eateries before! Saturday started off with lunch at Hopdoddy. 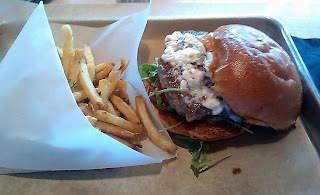 I had the Greek burger, a lovely lamb patty, cooked medium rare, with a nice topping of feta. Their french fries aren't too shabby either. 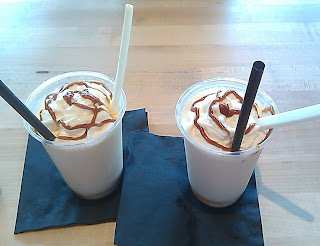 And what really pushed the whole meal over the edge is their caramel + sea salt milk shake. O.M.G. That evening, was Lobster Fest at Asti, in celebration of their 11th anniversary. Two dear friends are the mother and aunt of Executive Chef Jason Donoho, and along with some other food-loving friends, we ate very well. It started with stuffed mushroom caps, with a light goat cheese and just a touch of truffle oil. A roasted ruby and golden beet salad with fresh chevre and pickled onions. Caprese salad. While it may seem cliche, it really is the perfect summer bounty. And that moz was amazing. Pizza bianca, with prosciutto and another perfect little amount of truffle oil. I do not like heavy amounts of truffle; both of these applications were sheer perfection. And NOW, we finally get to the lobster. They prepared it two ways: in a corn risotto (the plate in back) and a fra diavolo (spaghetti with tomato sauce and toasted breadcrumbs). Both were great, but I particularly loved the risotto. Dessert -- tiramisu, with an almond brittle sprinkled on top, and a watermelon granita -- so light and refreshing! Our waitress, Claudia, was fantastic, and she also recommended the La Bambina rose wine we had with dinner, after our prosecco starters. Cin, cin to the food, wine, and company! I was expecting Sunday to be a quiet day, and probably just do stuff around the house. Well, friends called a little after 11am, wondering if I wanted a ticket to the Davis Cup tennis match at the Erwin Center that started at 2 pm. Um, YEAH!!! Davis Cup is the tournament of countries, as opposed to individual players, like Wimbledon. This round has been the US versus Spain, and the first team to win three matches advances to the next round. Spain was up 2-1 after Friday and Saturday; this match was David Ferrer (ranked 6th in the world, so not too shabby) and Mardy Fish (ranked 8th). It was a LONG 4 set match, with Ferrer winning after almost 4 1/2 hours, 7-5, 7-6 (3), 5-7, 7-5 (5). I hadn't been to the Erwin Center in years, and was almost immediately reminded how uncomfortable the seats are because of their narrowness! But it was a fun, raucous crowd, and a great event for Austin to play host to. Former US great Jim Courier was the team coach, and had Fish won, Andy Roddick would have been able to play on his home court, but it was not meant to be. Both guys played great, but Ferrer was able to capitalize more when it counted. After the match, we went to Hoover's for dinner. While I somehow missed on their menu that the meatloaf was covered in tomato sauce, it was still very tasty. The gravy on the mashed potatoes was certainly made with bacon fat! Looks like a great weekend! I've been meaning to try Hopdoddy out for a while, but I've never gotten around to it. 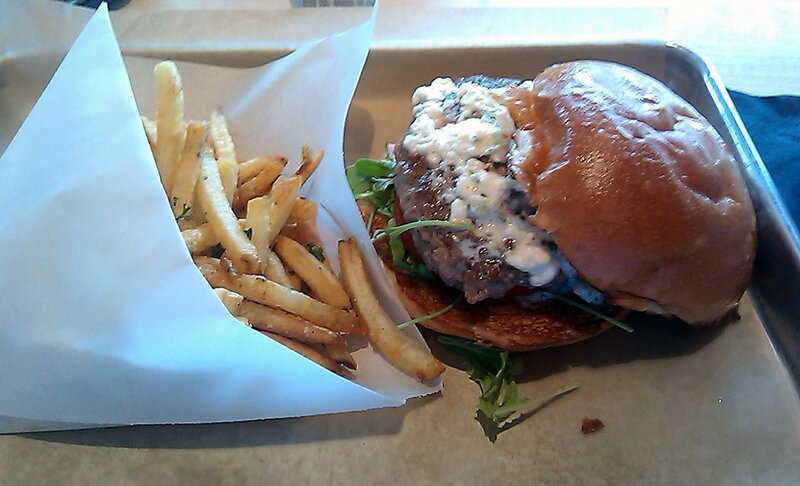 You should go try Hopdoddy! I actually went back with a friend 2 days ago, and we split the lamb burger, fries, & shake! (Splitting it was the way to go!) I was happy to see that at about 6:15 pm on a Tuesday, it wasn't a madhouse like my previous 2 visits there, as it can get very loud in there. Happy eating!